The Allendale Hampton Jasper Regional Library (AHJ) is the result of a successful Works Progress Admininstration library project. During the WPA era, there were three very small libraries in this tri-county area of the state - Estill (Book Club), Fairfax, and Allendale. The Allendale Library had been organized in 1905, long before the county was established. The Hampton Library was not organized until 1936 under the WPA. In March of 1941, Allendale, Hampton, and Barnwell counties formed the first multi-county regional library system in South Carolina. The WPA assisted with salaries, books, operating expenses, and equipment. With WPA funds, a bookmobile was purchased to serve the rural areas of the three counties in the region. In March of 1942, the WPA Project was discontinued, and the library was on its own. Barnwell County withdrew from the region in May 1942, but Allendale and Hampton counties continued to struggle to keep the library in operation. A small appropriation was secured from both counties, but it was so small that the library work was carried on by people very interested in the library's survival, and willing to give their services freely. The chairman of the Regional Library Board, Mrs. James M. Patterson, simply refused to let the regional library die. In October of 1947, Jasper County was invited to join the Regional Library to form the tri-county Allendale Hampton Jasper Regional Library system (AHJ). The Jasper County Library was sponsored by the County Council of Farm Women under the direction of Mrs. Betty Berry, Home Demonstration Agent. In 1961, the South Carolina State Library Board made an effort to lay the groundwork for a regional library system to serve five counties: Allendale, Beaufort, Colleton, Hampton, and Jasper. This would have been a region of about 112,000 people located in Coastal Carolina. Although the five-county region was never established, the project did produce a great outcome. The Allendale Hampton Jasper Regional Library (AHJ) received increases in local county appropriations and a new, modern bookmobile. The campaign also encouraged the establishment of county library service in Beaufort County, which had not previously enjoyed this service. AHJ Regional Library is governed by a board made up of members elected from the county library boards in each of the three counties. State Aid and LSTA grants are administered by the South Carolina State Library. It is an unfiled system with a single board, staff, and budget. The success of the AHJ Regional Library owes much to the dedication of Mrs. Louise Brunson, Librarian of the region from its establishment in 1941 until her retirement in 1971, and to her able assistant, Mrs. Lillian Howard. No road was ever too long or weather too bad to stop these two valiant women from keeping the bookmobile to its appointed schedule. 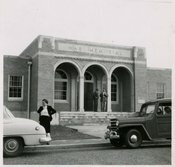 In 1974, the AHJ Regional Library was able to employ their first professional librarian. With professional leadership, the region was able to expand its services, its book collection, and add two branch libraries - Estill Public Library and Hardeeville Community Library. In 1977, Allendale, Hampton, and Jasper counties became eligible for Library Services and Construction Act Funds (LSCA). (Columbia: South Carolina State Library, 1981), pp.6-7.